Have you ever wondered what the perfect gift would be for someone who is going through a tough time? Something that says, "I've got your back, I'm in your corner." Dawn Reding took that question, and figured out the perfect thing. Alisha and Colleen talk to Dawn Reding of Gloves Up. This dynamic conversation with ultra marathoner, Dean Karnazes is not to be missed. Alisha and Colleen talk to Dean about what it's like to run Ragnar straight through, alone, and order a pizza to the course. Among so many other things. Alisha and Colleen talk to author and runner Ira Rainey. He tells of how he went from unfit to an ultra runner. And hear all about how Alisha has tried an awesome new running program! Author Lee Wolfe Blum joins Alisha and Colleen for a brave conversation about confidence, being a woman, and building each other up. And this is where you hear what happened the night that Dax Shepard responded to Alisha's tweet. Alisha and Colleen check in with MN native Jack Jablonski who updates them on life since his life altering incident during a high school hockey game that found him paralyzed. 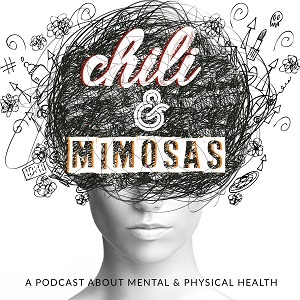 Chili & Mimosas S6, Ep10: DAX SHEPARD!!! Are you kidding? How did this even happen? Alisha and Colleen somehow got THE one and only Dax Shepard THE ARMCHAIR EXPERT HIMSELF to talk on the podcast! When Allison Offerman lost her own father to suicide, part of her healing included working a crisis hotline. That is where she learned that people in crisis are facing barriers to good health. After identifying those barriers, she found a positive way to meet the needs. Oh, AND she's an amazing running coach. Alisha and Colleen cook up a great idea with her! Alisha and Colleen talk with Amy Tatnell. An amazing woman with a unique life that has forced her to figure out how to put herself first so she can be there for others. This vibrant conversation will appeal to women and moms who find themselves forgetting to take care of their very own needs while they are so busy with the needs of others. Alisha and Colleen talk to an amazing woman who chronicles her journey to fitness on her blog, Getting Fit to Find Myself. Hear Missy Boeser talk about her amazing journey to running and weight loss, her hurdle after a TBI, and back to running in this dynamic conversation. Also, Ty Pennington. Lots of talk about perky Ty Pennington. Alisha and Colleen talk to a woman who has had the most amazing journey back to the ice as a hockey player who has found her way to her true self. It's an inspiring story you won't want to miss!